There are a few things that have really shocked me at how hard they are when you have a baby. I had all these romantic dreams of how we would go and hang out at the beach in the evenings and watch the sunset as a family and so on. Reality check! Babies go to bed WAY before the sun goes down and going to the beach isn’t as easy as it used to be. Next summer things will be far different, but being between the age of 4-7 months the beach is a little more than just a small adventure. We have figured out some simple things to make it possible after lots of trial and error and mistakes. The biggest being realizing how you really shouldn’t have your baby in direct sunlight. Something I never thought about till I held him that first week and realized how soft and fragile their skin is. 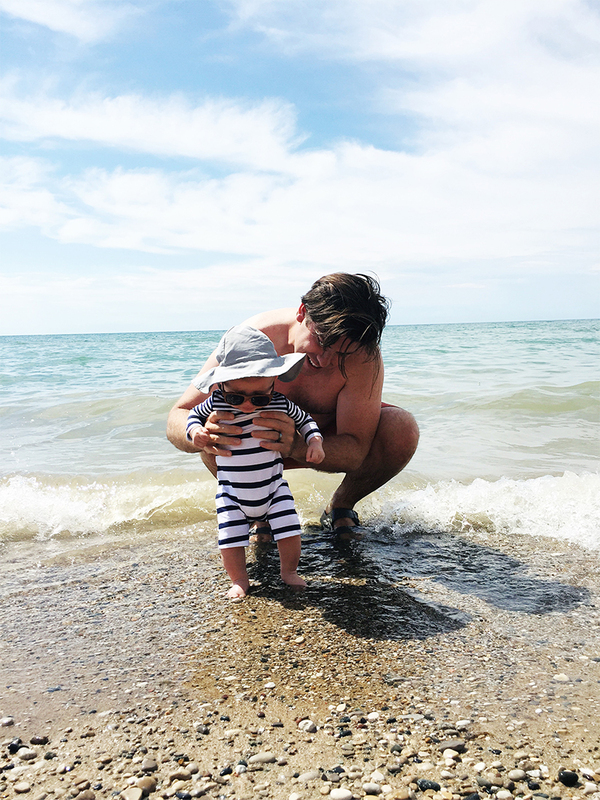 Since it is recommended for babies under 6 months to not have sunscreen on their skin and use other forms of protection we have been figuring out how to protect him while hiking, sailing, and heading for a swim. It isn’t easy but we have pulled together the gear we have on hand in the back of the car for any adventure in the sun and a few tips to keep in mind. 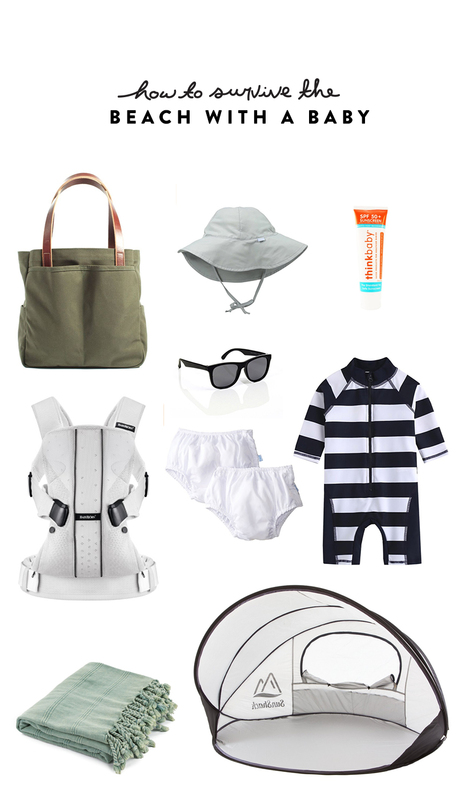 You will need something to bring all of the little things you typically bring anywhere you go plus extra things like sunscreen and swimsuits. This is exact bag we used for our recent trip to the beach for an hour or so. If your baby is under 6 months you will want to have them wear one of these. There is no way around finding one that is good, but this one is simple and unpatterened so it wins for us. Plus the price is right. You should have a baby in one no matter what, but particularly before they are able to wear sunscreen. This is for you and the baby if he/she is over 6 months. This is a great sunblock, but we also love the one from Honest as well. I looked all over for a simple swimsuit/rashguard for him that also provided sun protection. This one or the one we got from Carter’s which is no longer available were our picks. I really like these simple swim diapers that are reusable. We used them on the boat a few times and they worked great and wash up really well. If your baby will go for it get them for them. Their little eyes are still adjusting to the bright light and the light is very bright on the beach. Hayes thinks he is hilarious when he wears them so we have been lucky enough to get him wearing them. These ones are great! Those babies get sweaty and it gets hot carrying them around, so I think it is great to have your carrier on hand if you want to wander the beach for a little bit. We love using Turkish Towels as our go-to beach and summer use towels and blankets. These ones from Morning Culture are GREAT! 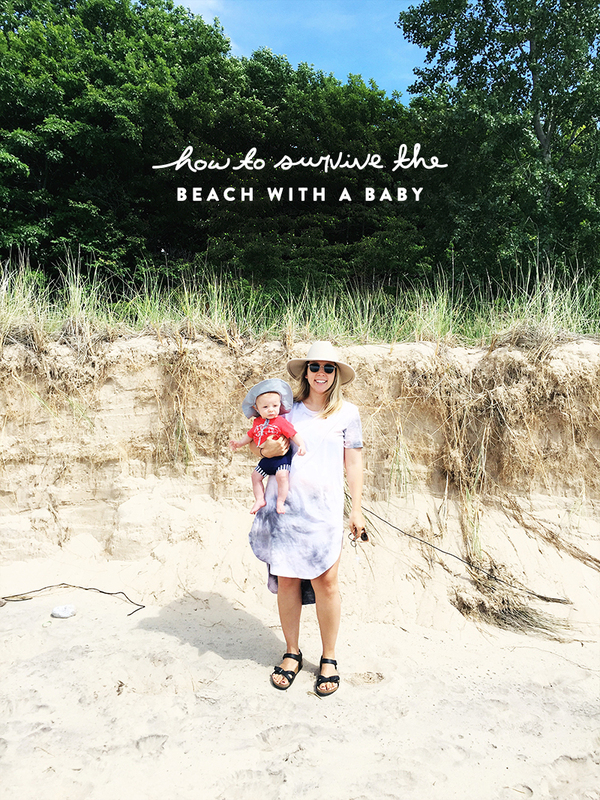 There is no shade on the beach so bring your own so your little one has a place to fall asleep without being in the sun or to just lay and relax while you catch some rays. Your little one will do better with the experience if they are well rested so whether that is after a car ride to the shore that’s more than 45 minutes or a good nap at home make it happen. Everyone will be happier. The beach is exhausting even as an adult, so you can imagine it is for them as well. Also, make sure it is not during peak sunlight. Early mornings or later afternoon is best for them in regards to sun protection. If your little one needs to take a nap it is nice to have a quiet space to let them do so. So find a good place that makes it easy for all of you to be at ease to get them to sleep. If the little one doesn’t love the idea of the water find a way to maybe make a way to dig in at their own speed. If you can dig into the sand and fill the hole with some water it will be a little warmer there than it would be the larger body of water. We plan to hit the beach a few more times this year before heading back to Raleigh especially now that hayes is getting to move and crawl around. He loves the beach and anything that is outside so I am sure we will be hitting a few of our favorites in the coming weeks. So parents, what are your tips? What essential items did we miss? Would you mind sharing where you got that fabulous dress in the first photo? Love it! Thanks for sharing these great tips! our 4 month old is quickly become a fan of the water so i can’t wait to take her to the beach. i’ll be adding a puddle jumper to our list of essentials. our swim instructor said they’re much safer than water wings.